5TH Annual Late-Model HEMI Shootout Announced! The NMCA Flowmaster Muscle Car Nationals, the #1 muscle car series the U.S., is pleased to announce that the 5th Annual Late-Model HEMI Shootout will have a new home at Summit Motorsports Park in Norwalk, OH, August 23-25, 2013. This NMCA event will feature all the cars and all the stars of the NMCA series as well as the coolest modern HEMI race and show cars in the country. 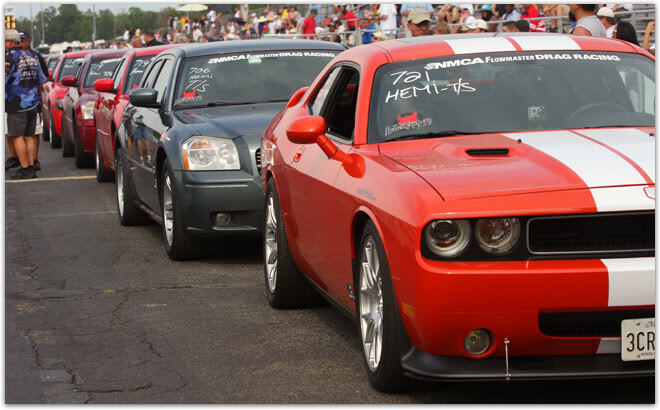 Late-Model HEMI competitors join the NMCA’s already large base of muscle car racers and enthusiasts. Other exciting features of this NMCA event include a huge car show, a giant manufacturers’ midway/swap meet and a 300+ mph jet dragster! The Late-Model HEMI Shootout is a special “event within an event” that features race & car show classes specifically designed for modern HEMI-powered Chrysler and Dodge vehicles. Each year the Late-Model HEMI Shootout attracts the fastest supercharged, turbocharged, nitrous-powered and naturally aspirated late-model Challengers, Chargers, Magnums, 300s and Jeeps in the country to compete on a national stage. This year the Modern Street HEMI Shootout Series will bring make this a points event for their index class racers and will award appearance points for their heads-up racers. Other special features of this event include an all-HEMI True Street class, racer contingencies, awards for the fastest HEMIs, and a special competitor welcome party and free parts raffle. Also, all racers and show participants will receive a collectible all-metal Late-Model HEMI Shootout license plate! 	Late-Model HEMI Rumble Class: Index-style rules. Friday/Saturday time trials (3 passes) and Sunday eliminations. HEMI Rumble competitor may compete in the Late-Model HEMI True Street class on Saturday FREE of charge if vehicle meets True Street rules. The Late-Model HEMI Rumble class will have contingency available from upwards of 50 manufacturers posting $150/win and $75/runner-up. The Late-Model HEMI True Street class is designed for “true” street cars that are licensed, insured and capable of making a 30-mile police escorted cruise! The class will be contested on the Saturday of the event (August 24th) and each racer will run three back-to-back passes for an overall average E.T. Awards are given to the overall fastest HEMI, runner up, and the closest averages to 10, 11, 12, 13, 14, and 15 seconds. For Late-Model HEMI Rumble and Late-Model HEMI True Street class rules, please refer to www.nmcadigital.com/hemi. Special awards will be given away to the world’s fastest late-model HEMI-powered competitors – Challenger, Charger, Magnum, 300, and Truck/SUV (Drag Pak Challengers prohibited). There will also be an awesome match race between the two overall fastest HEMIs at the end of the event. 	Mark Burkhardt Ambassador Award: A $100 NMCA Power Mall gift certificate and custom acrylic award will be presented to one Late-Model HEMI Shootout participant in honor of Mark Burkhardt, a good friend of the NMCA who passed away in 2009. The winner will be the person who the late-model HEMI community and NMCA recognize as contributing the most to the growth and success of the Late-Model HEMI movement in 2013. The Late-Model HEMI Shootout features exciting car show classes for enthusiasts who want to show off their awesome LX and LY Chrysler, Dodge and Jeep vehicles. There will be special awards given away both days (Saturday and Sunday). The NMCA is pleased to announce that there will once again be a special cocktail party and huge parts raffle open to all Late-Model HEMI Shootout competitors and friends. The party will take place on Friday, August 23, and will provide a fun opportunity for racers, show competitors, magazine editors and sponsors to welcome each other to the event in a fun, friendly environment. Location and times TBA. 	Race: Gene Bergstrom – 714-460-3813 or e-mail at [email protected]. 	Car Show: Ron Fetter - 949-254-5693 or e-mail at [email protected]. 	Vendor: Jeff Taylor – 949-784-9061or e-mail at [email protected]. 	Sponsorship: Aaron Hahn – 714-444-2426 X117 or e-mail at [email protected]. My friend was refering me about thie event, 2013 Late Model Hemi shootout as he was participating in the same. I hope I will be present for the event as he is a part of it and I don't want to miss such a good show. NMCA at Norwalk this Weekend! Late Model HEMI Shootout !!!!! !